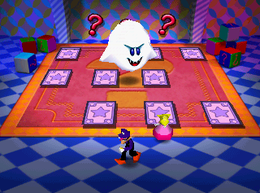 Stacked Deck is a battle minigame found in Mario Party 3. The name comes from the term "stacked deck", which is a deck of cards that was specifically arranged so that one specific player automatically gets a good hand and wins the card game in question. The cards flip over, showing the players where all the six Toads, two Boos, and four Baby Bowsers are on the cards, then the cards flip back over, and they all get shuffled in three possible orders. They are then placed in the playing field face-down. Players have to Ground Pound the cards that they pick, and whatever is on the card results in different things happening. The players are arranged in a line, and take a turn 1 at a time. A Toad card lets the player remain in the minigame until it is the player's next turn. A Boo card will scare all the players causing them to run away and instantly return in a shuffled order. A Baby Bowser card will kick the player out of the game, making the player lose. If a player does not Ground Pound a card within 10 seconds, Baby Bowser spawns automatically, making the player lose instantly because of "time up". The last player standing wins. Game Rules – "Use a Ground Pound to flip the card and find a Toad. If you flip over a Baby Bowser, you lose!" Advice – "If you flip over a Boo, the order of turns will change, so watch out!" This page was last edited on January 20, 2019, at 15:00.